Business process management and electronic process management involve a large number of complex processes. Making these transparent and simplifying them by leveraging new synergies are two of the core goals of our software. The enaio® ECM solution optimizes the flow of information from person to person and from location to location. Business processes in the form of digital workflows can be modelled, managed, monitored, and further developed. Moreover, this can be done throughout the company – for tender preparation, vacation requests, project management, approval processes, and much more. From digital document management to automated invoice receipt, workflows are tangibly accelerated. Numerous ECM features, such as subscriptions and follow-ups, create opportunities for employees to collaborate. enaio® provides options for systematically recording and evaluating all processes: Records Management and Process Mining. Business process management maps complex processes such as automated invoice receipt. Few people know that digital document management supports many business processes – provided the BPM software in use has a sufficiently broad range of features. Document management enables immediate access to all information, across the company. Setting up electronic records makes e-mails, letters, tenders, invoices, contracts, and documents available in the right context. Numerous ECM features support workflows involving documents. One of the key advantages of using enaio® to optimize business processes is the automation of frequently recurring work processes, such as ones for forwarding incoming post. This is carried out with the help of Workflow Management in enaio®. But even when processes are perfectly organized, there still needs to be room to make spontaneous decisions. The enaio® Workflow module allows you to implement processes with fixed structures as well as ad hoc ones based on given situations. 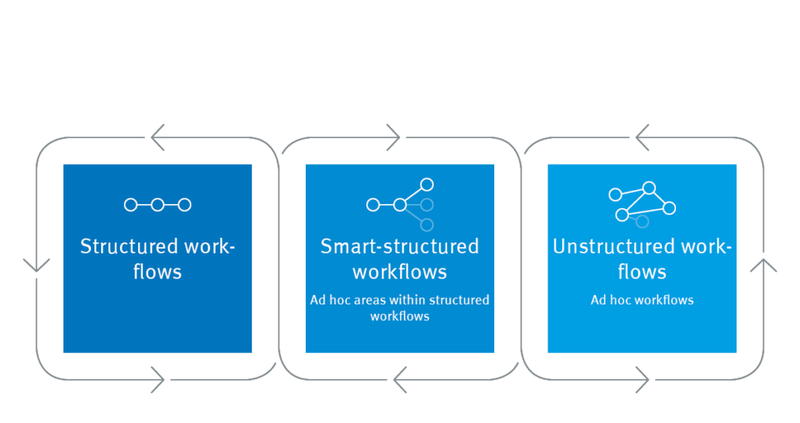 These smart-structured workflows keep processes flexible. In turn, this gives your employees room to make personal decisions, such as to submit follow-up inquiries or grant additional approvals. We recently introduced the solution, and many of our employees already appreciate the new level of transparency and accelerated work processes.